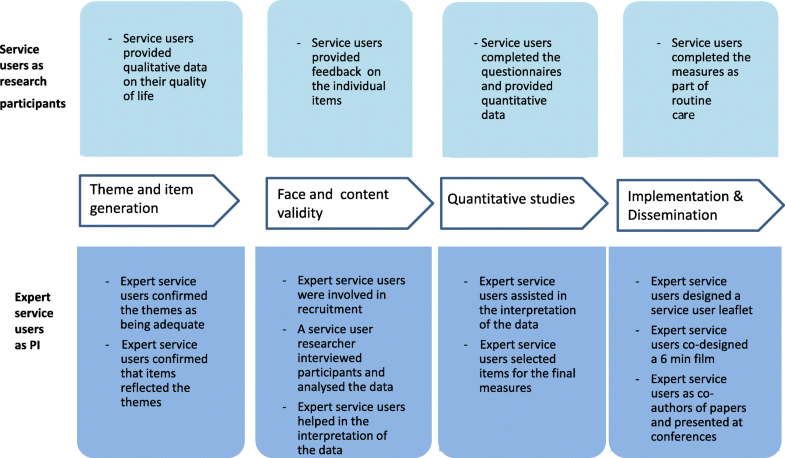 The notion that people with lived experience of a health condition should be involved in designing and conducting health research has become increasingly acknowledged and valued in the United Kingdom (UK) and internationally [1, 2, 3, 4]. Public involvement (PI) in the UK has been defined as “research carried out ‘with’ or ‘by’ members of the public rather than ‘to’, ‘about’ or ‘for’ them” . Thus, PI is distinct from patients as research ‘participants’ from whom data is collected, and is focused on ‘involvement’ in the actual design and conduct of research. It is said to lead to research of a higher quality that is more acceptable, relevant, transparent and accountable [6, 7, 8]. Guidance for reporting PI in health and social care research has been developed to allow researchers to learn from best practice in different health specialties . 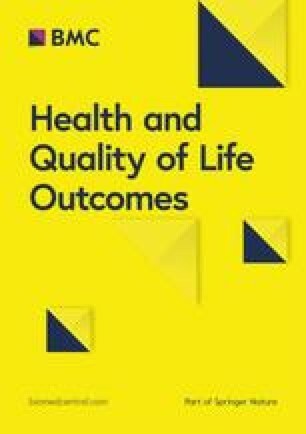 Recovering Quality of Life (ReQoL) is a new instrument which measures mental health service users’ own perspectives of ‘recovery’ and ‘quality of life’ . It was developed from the outcomes that service users identified as being central to them, as well as from the literature [19, 20, 21]. The stages of measurement development include the identification of themes and items (Stage 1), the face and content validity with service users (Stage 2), and the psychometric testing by collecting data on the draft questionnaires (Stage 3) before finalising the measures. ReQoL is available in both a short version for clinical assessment (comprising 10 items, ReQoL-10), as well as a longer version (comprising 20 items, ReQoL-20). Both measures are suitable for self-completion and for use across a wide spectrum of mental health conditions (both psychotic and non-psychotic) and for different levels of severity, for individuals aged 16 or over. The intention was to deliver a rigorous service user-centred and service user-valued PROM with high face and content validity. In most PROM developments, patients are solely research participants providing data that are used in the process. Ethical approval to use data from patients in research is sought through the relevant authorities. This paper focuses on the involvement of expert service users as research partners with other service users as participants in the study. The aims of the paper are to provide an example of PI being deeply embedded in the development of a mental health PROM and to critically assess the contribution of expert service user involvement.